The Bucs are a team in turmoil. Defense too rotten for words. Linebackers going after a Bucs legend on social media who wears a gold jacket. No running game. Quarterback controversy. Head coach rumored to be on hot seat. It’s a freaking mess. But amid the gloom and doom is a bright light. That’s when the Bucs are in trips formation (three-receiver sets, regardless of personnel groupings). In fact, the Bucs are the most dangerous team in the NFL when in this offense. 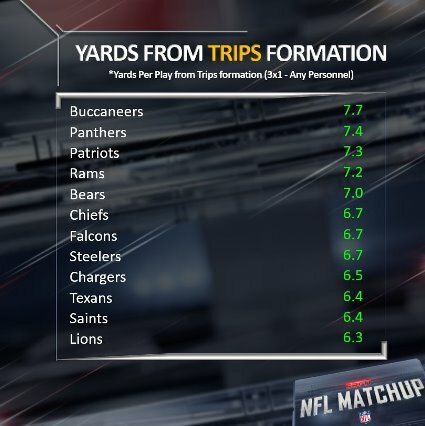 Per the good folks of NFL Films who break down tape for BSPN’s NFL Matchup, the Bucs lead the NFL when throwing from a trips formation. Joe understands the team cannot be in trips all the time, but damn, if that is the one thing you do very well with, the more the better. The Bucs have the deepest set of passing targets in the NFL. If you are going to go down, may as well go down with guns blazing. That’s the problem to many deep long developing plays. With no run game. Shaking OLine equals disaster. Keep Dirk, licht, and Jameis on the 5th year option. Trade McCoy for a 3rd or better. Extend Kwon for cheaper now with the injury. At this point any plan is looking good right now, even yours. I doubt you get a third for McCoy. What I don’t get is that Warhop has been here awhile and the O-line seems to have regressed each year, very puzzling. No run game for years either. That is one UN-impressive resume. If this game goes like the others then yes, I think you may be right…..
Stats are for losers. And guess what the Bucs are? 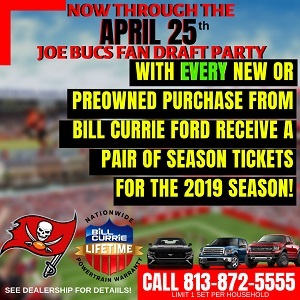 Bucs win 35 – 24” <—-Make sure you're back on this site about 4:30PM Sunday to admit you were drunk when you said that. “The Bucs are a team in turmoil”. Joe, no they’re not; the team turmoil ended back when Jameis was suspended. Now the Bucs are not even a team. 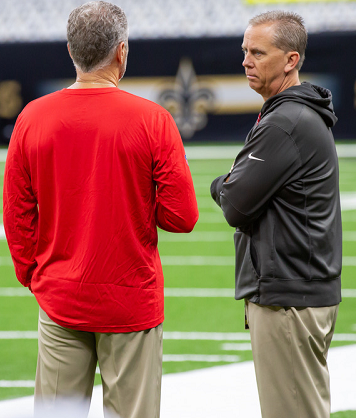 No future QB, the worst defense in the NFL, and a coach who everyone knows will be fired at the end of the season (earlier?). They can’t even properly execute a fake punt attempt. The RJ stands are full of the other team’s supporters. Turmoil? No, it can’t get much worse than this. Even the Browns, who have a 2-6-1 record vs. our 3-5, are looking up. The Browns have a rookie QB who can be a top tier player in a few years. Us? We have a 35 yo QB who has one, maybe two years left in him, and a former first round draft pick who wants to take unnecessary chances on every play. Go back and look at the Hard Knocks videos. There is one scene where Koetter tells Jameis that he doesn’t have to carry the team on his shoulders, that he can rely on the talent around him. He didn’t listen then and he’s not listening now. Question for you guys to ponder in traffic today. What’s the over/under on earliest year we make the playoffs? Does your answer require a totally new regime to get there? The only trips we need to worry about are trips to the end zone. Unfortunately we don’t rank first there. Joe the day we get points for throwing for a lot of yards then and only then will YARDS matter!! Any chance of getting Jimmy Johnson out of retirement? Bring in Coach Arians. He already has a relationship with JW and if he can’t fix his mechanics and hardheadedness then that’s a lost cause as far as JW being our franchise. Go ‘Bucs !!! The title of this post should have been “Excrement.” I would guess that much of this yardage has come during garbage time. I used to think you guys that wanted LaVonte out of here were nuts. You were right. He is not a leader. And this week vs Sapp (who is more passionate about our team than our guys are)….. embarrassing. Yes, good bye LaVonte too. Because of their contracts, McCoy and Jackson aren’t worth much. DJax is actually playing up to his contract, so he might be worth something. McCoy isn’t worth even close to what he is getting paid. Just to get rid of of his contract the Bucs would have to offer an Osweiler-type deal. Here, take this contract, take the player, and have a 5th round pick for helping us out. That being said, I think we can cut him with no cap hit. The money spent on him would be much wiser spent on two or three good players that can help. Unless a player is first ballot HOF worthy, there is never a good reason to dump all your cash (eggs) into one defensive player (basket). 100% of all NFL players get hurt. This is why I hated the Khalil Mack trade from the start. To pay that much money and that kind of pick ransom is absurd. Mack got QB money, money that would be more wisely spent on four or five good players as well as the two 1st round picks that would definitely help the team more in the long run…especially when Mack gets hurt or is ineffective.